Last night I watched The Innkeepers on amazon prime. I was excited. I have noticed a new trend towards more classic ghost stories and haunting stories and have been really thrilled about several movies I have seen in trailers lately. 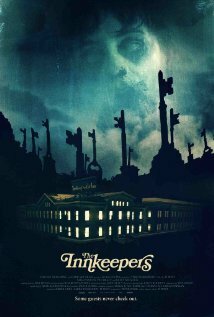 The Innkeepers is the story of two young hotel clerks who are left in charge with running a hotel on its last weekend before it shuts down. The hotel is said to be haunted by a woman named Katherine O'Malley who hung herself after she was jilted by her fiance. The two clerks are ghost enthusiasts. They have tried to find ghosts in the hotel before and even have a website. They decide to give it one last go before the hotel closes down because the hotel is almost completely empty. The movie began very slowly. There was a tremendous amount of character development. Normally, I salute a steady ramping up of tension through character development and atmosphere. This movie certainly tried to do this. However, the characters weren't overly interesting so I found myself getting a little bored by this in the Innkeepers. It got so bad, I played scrabble on my phone after a while. When the ghosts finally started to appear, they were kept mostly in the shadows. This was very well done. After the slow start, the actual haunting portions of this film wasn't that bad. Overall, The Innkeeper was an alright film. It wasn't great, but I think I might have rated this movie lower than it might be to others because my expectations were so high. I was really looking forward to this atmospheric ghost story. Oh well, I am going to see The Woman in Black tonight and maybe that one will bring a few more chills and I won't play scrabble through it. Just read a review of woman this afternoon: http://wapo.st/ylmaGh (Washington Post review). You convinced me! I'm going to have to see it. Sounds good to me. The Woman in Black looks very scary. Can't wait to read what you think of it.